Motorcycles that come equipped with better-handling, along with several refined features, make it an absolute blast to hit the road. What’s even more impressive about these motorcycles is that riders of all levels can easily jump onto one of these bikes and enjoy the experience without having to learn new controls or how to handle a new bike. Below you will find the best motorcycles of 2018 that are designed for any rider. You can always rely on the Italians to produce a vibrant and brawny motorcycle with a big engine to compliment the overall look and feel. 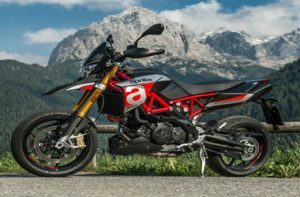 The latest Aprilia Dorsoduro 900 comes with a twin-cylinder engine that produces a whopping 93 horsepower. With a narrow profile, you will also find that the Dorsoduro makes things a lot easier to navigate through traffic. What’s even more impressive is that the Dorsoduro comes equipped with a Bluetooth interface that can link up to cell phones through the bike’s handlebar controls. You can buy the new Aprilia Dorsoduro 900 for a mere $10,999. Those that have a craving for comfort and speed will find an excellent balance in the KTM 1290 Super Duke GT. The KTM is extremely powerful, boasting with 179 horsepower with a V-twin engine along with a lean, smart, angle-sensitive stability system as well as a suspension setup which stiffens automatically depending on the conditions. 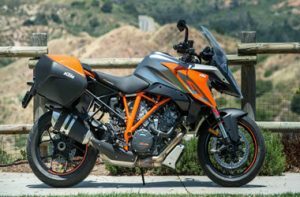 You can get the KTM 1290 Super Duke GT for only $19,999. The Gold Wing from Honda is undoubtedly the king of long-distance riding. The fresh new design is powered by a six-cylinder engine and is 90 pounds lighter than the previous version. It also features a bunch of features, such as a wireless smart key, Apple CarPlay, electronically adjustable suspension, and a 7-speed dual-clutch transmission along with a reverse gear. 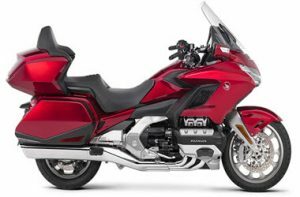 The Honda Gold Wing Tour goes for $26,700. 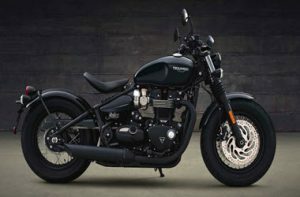 You might be surprised to learn that the Bonneville Bobber is the quickest-selling motorbike in the history of Triumph. The new Bonneville Bobber offers a nostalgic custom that is inspired by the 1940s era with large tires and wheels along with a single floating seat. You will also find integrated tech, such as cruise control, traction control, and antilock brakes to further compliment the blacked-out components. The Bonneville Bobber can be picked up for only $13,150. The notorious GSX-R from Suzuki finally entered the beginner realm. Powered by a 250cc twin engine, the GSX240R from Suzuki combined endearing qualities with sharp-edged styling, drawing more people into motorcycling, especially those that have never been on a bike. The slim fuel tank, low seat height, and extremely lightweight is an excellent option for daily commuting. 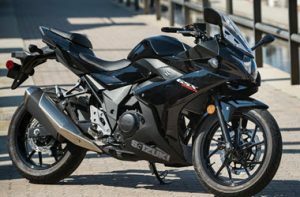 The new Suzuki GSX250R can be purchased for a mere $4,499, making it the best option for beginners.